Chic and cheerful…elegant and enthusiastic…this standout bouquet is a delightful way to wish family and friends the happiest of holidays. Puffy white mums as large as snowballs (but much longer lasting!) 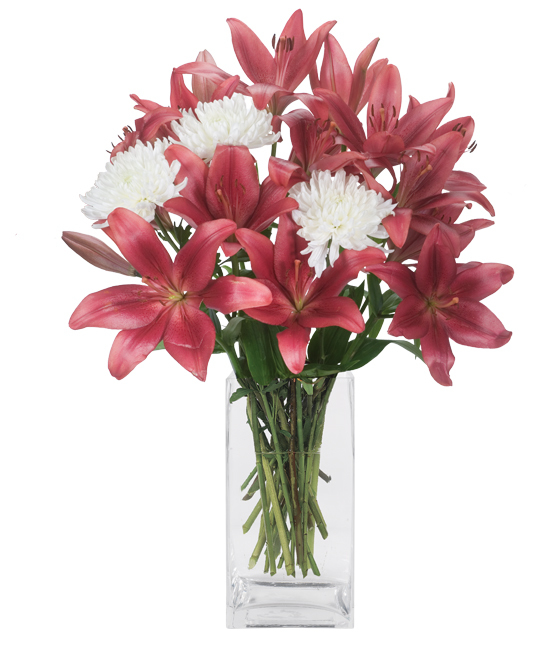 and Christmas red lilies are a festive combination and indeed a showy display inside our substantial curvy red glass vase. Remove all foliage that will fall below the water line. Change water and re-cut stems every other day. As the lilies open, you may gently pull off the pollen anthers to avoid pollen dust. Be careful not to get lily pollen on your clothing or linens. You may wish to place a protective mat under your bouquet to prevent pollen from falling on your furniture or carpet, if you do not remove the anthers.